Unfold the pastry sheet on a lightly floured surface. Roll the pastry sheet into a 16x12-inch rectangle. Spread the cream cheese on the rectangle to within 1/2 inch of the edge. 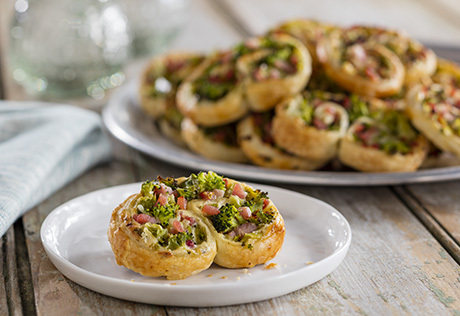 Top with the broccoli and ham. Starting at one long side, roll up like a jelly roll, only to the center. Roll up the opposite side to the center. Brush between the rolls with the egg mixture, then press the rolls together. Cut into 32 (1/2-inch) slices. Place the slices cut-side down onto a baking sheet. Brush with the egg mixture. Bake for 15 minutes or until the pastries are golden brown. Remove the pastries from the baking sheets and let cool on wire racks for 10 minutes. Tip: To make ahead, place the unbaked slices onto a baking sheet and brush with the egg mixture. Cover and freeze until firm. Remove the frozen slices from the baking sheet and store in a resealable plastic bag in the freezer for up to 1 month. Bake frozen slices on a baking sheet at 400° F. for 20 minutes or until golden brown.